I needed to do something a little more creative today after days of editing my California images, so I decided to take another crack at the Forgotten Postcards series. This image was taken at the Pont du Gard aqueduct in Southern France. I’ve been to this location 3 times now, and it never ceases to amaze me how people constructed this enormous structure by hand. The best guest is that it was constructed in 19 BC. Wow. I hope you enjoy my tribute to this magnificent structure. 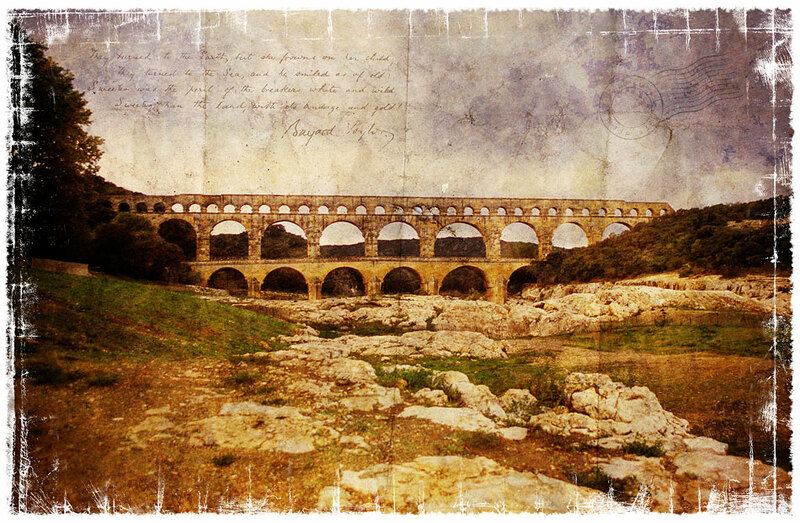 This entry was posted on Thursday, September 25th, 2008 at 16:09 and is filed under Digital Art, Forgotten Postcards and tagged with architecture, art, digital, forgotten, France, photoshop, pont-du-gard, postcard, Travel, unesco. You can follow any responses to this entry through the RSS 2.0 feed.